The labor movement stirred mixed sentiment in America, but many workers believed it offered a unified voice that would hasten improvements. Organized labor played a role in America’s social and cultural development — and in establishing protections for workers and the first notable commemoration of Labor Day. Throughout the country’s history, sculptors, composers, authors and painters etched their perceptions of workers’ lives into the social consciousness. “The truly great man is he who would master no one, and who would be mastered by none,” Kahlil Gibran, Lebanese-American artist and philosopher, mused in Sand and Foam, his 1926 collection of spiritual reflections. Gibran’s quote is engraved beneath the arches of Transcending, a 19.2-meter steel-and-granite monument to the legacy of labor that rises above Hart Plaza in Detroit, the heart of the U.S. automobile industry and witness to labor’s sterling successes and devastating defeats. Raised in Detroit during turbulent times, Philip Levine would convey a poetic message about the working class. The 1930s brought notable work stoppages — “strikes.” It was a restless period that painted the boyhood backdrop for Levine, who arrived in 1928 as a newborn son of Russian Jewish immigrants. Harking back to the original New York holiday, local governments host picnics and sporting events on Labor Day. Schools and offices are closed. Union leaders and government officials make speeches honoring the collective achievements of American workers. Americans, however, have many definitions of work based on many different experiences, so a day set aside to honor their work reflects those differences. 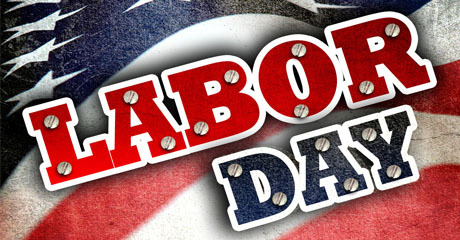 Marching in a parade or not, going swimming or not, visiting friends or not, Americans honor the essence of Labor Day simply, by taking the day off … or not. Levine worked in factories while attending university in Detroit, including a night shift at an automotive gear and axle factory. Online readers may listen to Philip Levine read “What Work Is” at the Library of Congress.